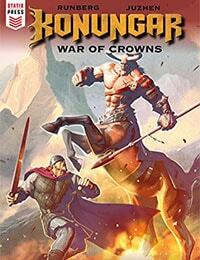 Konungar: War of Crowns Average 0.00/5 - out of 0 total votes. "A gorgeously rendered epic fantasy from the writer of Titan's Millennium series – Sylvain Runberg. Two sons at war – in a battle for the throne that has torn their country apart. The centaurs, mortal enemies of the Vikings, taking advantage of this conflict, have declared war on humanity. To combat this ancient foe, the two brothers must put aside their differences for the good of their people."